SAN FRANCISCO--(BUSINESS WIRE)-- The Golden State Warriors, Chase Center and RingCentral, Inc. (NYSE:RNG), a leading provider of global enterprise cloud communications and collaboration solutions, today announced a multi-year partnership. 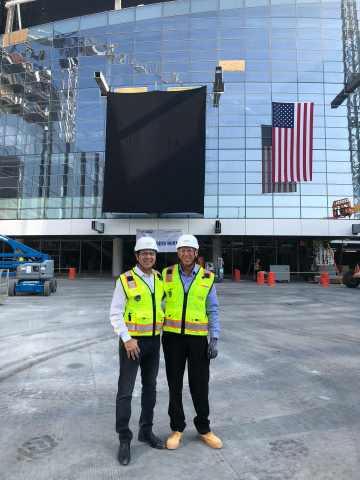 RingCentral will now be the Official Enterprise Cloud Communications Partner for the Warriors and a Founding Partner of Chase Center, the state-of-the-art sports and entertainment complex being built in San Francisco’s Mission Bay neighborhood, scheduled to open in September of 2019. In addition, all Warriors business offices and Chase Center operations will use RingCentral to exclusively power its communications. Warriors Owner and CEO Joe Lacob and RingCentral Founder, Chairman and CEO Vlad Shmunis announced the news today at RingCentral’s ConnectCentral® 2018 conference in San Francisco.